So and is done, but there is(were in 1.08-09) some bugs with these programs. By me,natural sky looks more blue(like 1.06 sky). Also most cameras esp. smartphone cams have pronounced peaks in colour sensitivity and struggle with the huge dynamic range of sky lights. It takes a lot of work to get the sky look the way you see it when taking photos. With a mobile it's impossible 99% of the time. Furthermore, atmospheric conditions, altitude, dust particles, season...any sky simulation can only come so close without eating up too many resources. When talking about the atmosphere I think xE does a better job of simulating it than any other plugin (incl. Active sky and real sky etc. which I own) (mind you atmosphere. Clouds is a different topic). It's not always spot on but then your own expectations often aren't either because we look at things with an interpretative look if we don't remind ourselves to actually observe. For anyone still asking if it will work with ortho: yes, it will. Can we expect these amazing overcast moving clouds in the next update? As far as I'm aware: everything but snow is earmarked for 1.10. The snow looks great! I just purchased TerraMaxx which adds seasons and wonder if you've considered how this would work with (or not) or compliment that? 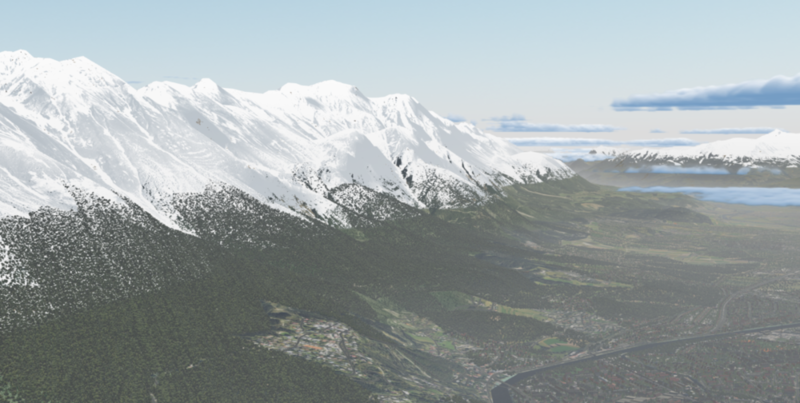 xEnviro seasons (at least the snow at this point) is completely independent of ground or object textures. TerraMaxx replaces the ground textures to achieve the seasons and xEnviro will just be "laid on top" of that. We will have to see if it actually turns pout this way, but xEnviro should be completely compatible with terramaxx. With that said, when xEnviro seasons is released it would replace the need for TerraMaxx (sorry John) and the effects of xEnviro might even be somewhat reduced. Like in valleys where you would have snowy mountainsides that transition over to snowless lowlands would be gone. The effect you see in the images above would be watered down if you have pure snow textures beneath them. Thanks for the response - I appreciate it! 30km VS 15km height. The difference in atmosphere density together with weather data controls the color of the sky . It's Game over... This wins any possible duel. Should we add some shadows to those clouds? Haze? Extra cloud layer? Maybe buildings on the ground reflecting the sun from the right angles? Clouds seem to be happy in the new atmosphere. It's like they belong there. And they dance before our eyes while we try to add and test features. Some for 1.10. Others for later - but thrown in to see how it plays with the rest. The road ahead will be, among a lot of other stuff, to give the clouds character and to shape and define them. While we now assemble and add our carefully prepared ingredients we need to tweak and adapt along the way. People are asking about performance. It's no use talking about performance at this stage. While it is still very much within our tolerances a LOT can happen along the way. As always: our aim is to have better performance than 1.09 and performance is in focus. Anyways, enjoy the latest results but remember that it is still rough. Very rough. I really appreciate all new screenshots . xEnviro become more and more realistic ! I just want to know if we will have beautiful Cirrus high clouds on this new version ? This looks fantastic. Do you consider to release a demo version one day ? I hesitate a lot regarding performance and that would be a good thing to be able to test. We will depict all sorts of clouds, but we will have to sacrefice on something when going for volumetric clouds. We definitely believe that it is worth the effort and with time the resolution of the clouds will be higher. As for now we are trying to find the sweetspot between cloudporn and performance where performance is the higher priority. So, in the beginning we might see some types of clouds better depicted than others but rest assured we continue to work beyond 1.10 and Vulcan might give us a push in the right direction. As for a demo, no. Sorry. But we'll have some good performance with this update and we'll be completely open on that front. In this first picture you can see some of the artifacts we are working on. You can see them on the upper layer. We hope to get rid of them completely but they are a bugger to work against.